week one of having a warm and savoury breakfast on weekdays went well. so well, however, that i needed a change. despite having month-long stretches where all i ate before work was yogurt and granola, something about my breakfasts last week made me think, "good, but…i'm kinda done" by thursday.i think something like squash polenta with winter greens is very…distinctive so it needs to be rested. i may find the same thing with the breakfast i've chosen for this week, but for now, i'm eagerly anticipating the next time. i took 5 minutes yesterday and fried up some leftover rice with scallions, and chopped extra raw scallions for the week. 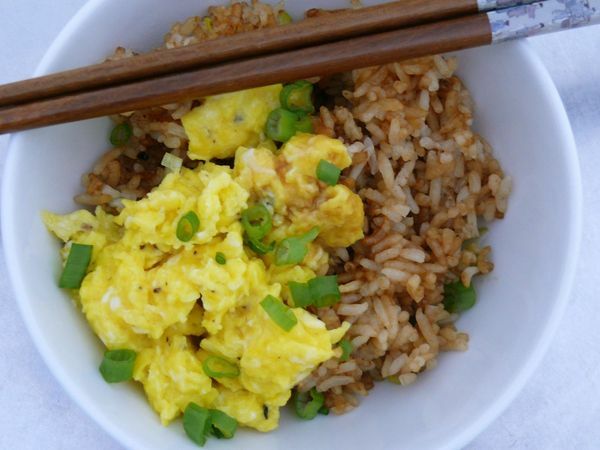 then, in less time than it took for the water for my tea to boil this morning, i heated half a cup of rice, scrambled an egg and sprinkled some of those reserved scallions on top. it was easy, and trust me, i was tired this morning. i was slightly worried that i might try to scramble some juice and drink an egg, but this was easy and fast enough for a pitch-dark monday morning in january. and just the thing to make it an enjoyable one. I don’t like eggs because they’re often cooked poorly but your scramble looks good. I’d eat that! haha! yes, they come to my email–thanks for the comments and for taking the time to catch up!